“There’s no whiskey!” announces the bartender. Upon hearing this dire pronouncement, a stunned barfly ambles out of the pub and takes to his bed, dying soon after. 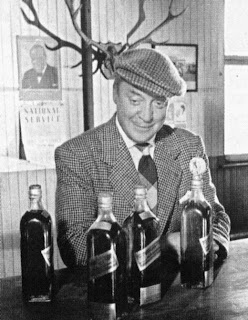 Thus begins Whisky Galore, a delightful comedy from Britain’s celebrated Ealing Studios that looks back at the liquor rationing of World War II. 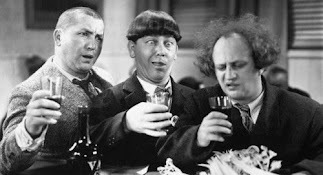 The story takes place on Todday, a small island 100 miles off the coast of Scotland, where the government allotment of four bottles of whiskey is nowhere near enough to sate the thirst of its residents. Without the golden liquid, life looses all meaning for the islanders, until a miracle happens--a ship carrying 50,000 cases of whiskey wrecks upon the rocks surrounding the island. The crafty islanders have to overcome several obstacles on the way to their beloved drink, including a military guard on the ship, the local bartender who sees the cargo as a threat to his business, and the religious requirements of the Sabbath. Even after the islanders are once again suitably lubricated, the narrator informs us that all did not live happily ever after, because the whiskey eventually ran out. Potent Quotables--NARRATOR: Whiskey… Usquebaugh… In Gaelic they call it “the water of life,” and to a true islander, life without it is not worth living. 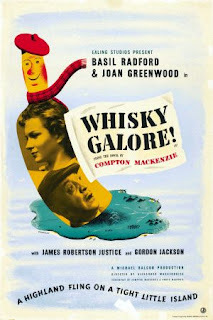 Video Availability--Whisky Galore is available as a solo DVD and as part of the Ealing Studios Comedy Collection (Anchor Bay). Similarly Sauced Cinema--In the World War II comedy, The Secret of Santa Vittoria (1969), the mayor (Anthony Quinn) of a small Italian town leads the populace in their attempt to hide a million bottles of wine before the Germans occupy their village. I'm learning about history while I'm reading about drinking and movies. You rock! oh, this didn't really happen did it...I mean besides the whiskey ration. This is probably the greatest booze movie ever made.